A couple weekends ago I hosted a French Wine Tasting for a group of co-workers, and we tasted 15 wines from the recent vintages of Bordeaux and Rhone. The reason for the tasting was to focus on and take advantage of the recent successes in these regions, specifically in 2009 and 2010, but also to compare back to the still developing stars of 2003 and 2005. In terms of value, the St. Estephe region on the left bank of the Gironde River in Bordeaux has long been a top choice for my cellar. Even with the skyrocketing prices of first growth Pauillac wines like Chateau LaTour or rare right bank cult favorites like Chateau Petrus ($1600 and $4000 respectively), there are still plenty of knockout wines in the $20-40 range from this region. Of the 2009s I tasted, by far the best value happened to be a St. Estephe wine that I happened to secure futures on and is resting comfortably in my cellar as I write. While drinking incredibly well for its youth, its opaque texture and dark flavor profile should benefit from aging as well. 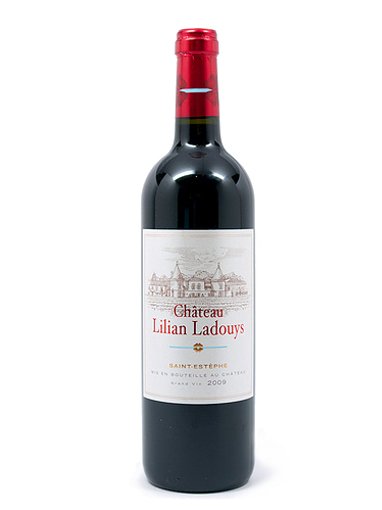 Chateau Lilian Ladouys St. Estephe 2009, 93 Points, $25, 18,080 Cases Produced- Toasty aromas of mulled fig, mesquite and black currant. Rich and spicy, with an elegant, deep mouthfeel of thick blackberry, dark plum and fig flavors backed up with well-balanced mocha and chalky mineral. Long, intense finish.